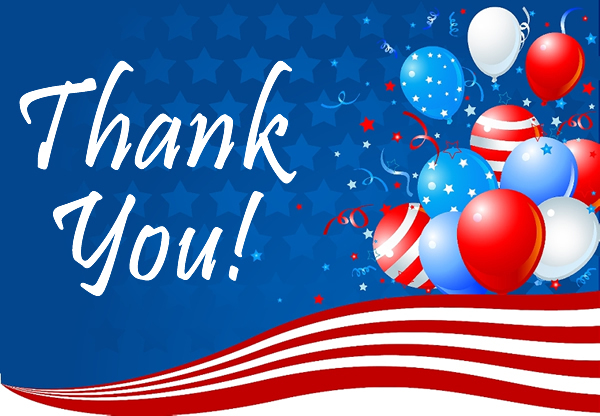 Thank you…two simple words that are easy to say and mean so much. This Memorial Day weekend, I came across veterans sitting in front of the Wawa collecting for disabled vets. I have NEVER in my life passed by those men without making a donation, even if I have gone into the store on multiple occasions over the course of the weekend. In fact, I have amassed quite a few poppies over the past few days thanks to them. Aside from always donating, I always make sure I look those men in the eyes and say “Thank you for your service”. If you have never done that when donating, you really need to. Those men appreciate a thank you just as much, if not more than the donation itself. It always makes them smile and sometimes even makes them teary eyed. They deserve every single thank you that they get, and then some if you ask me. When I see people walk by them like they are invisible, it actually disgusts me. If you don’t have any money to donate, a simple thank you is what they deserve at the very least. Today on the way to my parents house, we drove past a coin toss for a different volunteer fire company. My daughter had never seen that before, but happily scooped out a bunch of change I had in the car. I slowed almost to a stop so she could throw it out the window at the target. The firemen all smiled, waved, and yelled thank you to us. As I drove away, my daughter remarked how happy the firemen seemed that we donated, and smiled at how they had so heartily thanked us…then noted that no one else had slowed down and done the same….and it bothered her too. On the way home we passed them again, and once again I slowed down so she could throw a big handful of change at the other target. This time they beeped the fire truck horn at us, smiled, and yelled thank you. Sadly, again she noted that no one else had slowed down and thrown their change. She said she hoped that we weren’t the only people that participated in the coin toss, because in her words, “It’s just not right.” I assured her that we weren’t but she didn’t seem very convinced that too many other people had tossed some coins, despite the signs preceding it for about a mile. If I have taught my daughter anything in life, it is the value of “thank you”. 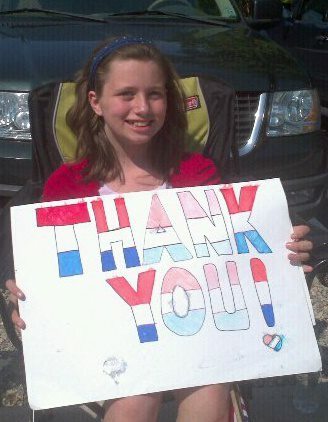 Every time she sees a veteran collecting or anyone in a military uniform, she thanks them for their service. When she sees the firemen or ambulance squad doing their fundraising, she always says thank you for volunteering as she makes her donation too. I’ve taught her that anyone who makes a sacrifice for others should hear a thank you from the public. It’s a shame when a 10 year old knows better than the adults she sees around her…but I am pleased that she notices it and points out that it’s wrong. Tomorrow she is excited to go to the Memorial Day parade in town, so she can wave at the veterans and give thanks to them. I hope there is a decent crowd on hand, for her sake and theirs. It’s a sign of respect these men and women deserve, but often don’t receive enough. To all of the men and women who currently serve or have served this country, I wholeheartedly say THANK YOU for your sacrifice. (Thank you to the Police Officers, Firemen, and EMTS too!) My daughter and I appreciate your service. Don’t forget to use them as often as possible. Those two simple words matter.